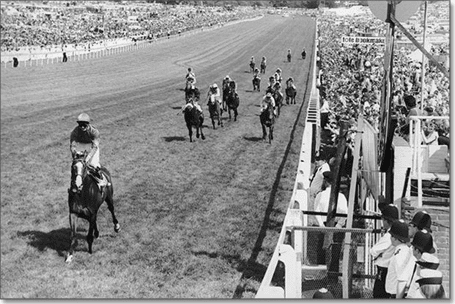 The Epsom Derby, as it is referred to outside of England, is run over one mile and four furlongs and has a prize purse of over 1,250,000 pounds. Many races have tried to emulate it, but few can match the Derby when it comes to the sheer excitement and public interest it brings to the sport. The race brings in a gigantic TV audience worldwide and keeps the sport of kings in the hearts and minds of the people. The English Derby is known in some areas of the world as the Epsom Derby. This is due to the fact that the derby moniker was adopted for other races around the world – most notably the Kentucky Derby – but the English refer to it as simply: The Derby. The inaugural race was in 1780 and is named after the Earl of Derby, who won the right to name the race after winning a coin toss bet with Sir Charles Bunbury. Only once has a winner been disqualified for interference from the Derby, a horse named Craganour in 1913, after stewards found the horse had inhibited the chances of runner-up Aboyeur in the straight. In 1844 the race winner Running Rein was stripped of the Derby crown after it was revealed it raced as a four year old. After six weeks in court the title was eventually handed over to the runner-up Orlando. The derby race was moved to the Newmarket course for a brief period during World War I, but was moved back to its original home after hostilities ended. As of 2015, 42 Derby winners have gone on to sire victorious winners of the same race. With such a long and storied history in the English racing landscape, the English Derby; along with being the richest flat race in the UK, is the biggest and most popular race Britain has to offer. After changes to the race in the last century, the field for the derby will never be over 20 horses, and as such it makes for a much more competitive race as the level for entry into the field is much higher. The race is much like any other you will come across with the typical Win, Place, Trifecta and other exotic bets, but because the Derby is such a big race, the fixed odds markets are released much earlier and will fluctuate as horses are scratched or added to the field. The winner of the 2,000 Guineas, the first leg of the prestigious British triple crown, is installed race favourite, however, only two horses have achieved the feat in the last 10 years, Sea The Stars in 2009 and Camelot in 2012. Finding a winner in the Derby is becoming even more of an arduous task to, with trainers now opting to work their horse at home rather than going the more traditional route of lead up trail circuit that typically pre-empted the big race, however, the race has belonged to Aidan O’Brien since 2011, with the champion trainer winning an unprecedented three-consecutive Derbies — and winning form is good form when it comes to the horses. Those punters looking to make an investment on the English Derby will have a lot of options leading up to Britain’s largest and most recognisable flat race. Most of the big corporate bookmakers and sportsbooks around the globe will have a market framed for the Derby months, or sometimes even a year, out from the big event. A good example of this is betting giant Bet365, they cater to most countries around the world and offer a huge selection of odds and bet options on the Derby. These include fixed odds markets prior to the race, with a no-runner no-bet policy and a ‘best bet odds guaranteed’ proclamation. Most of the other big betting companies in the UK like William Hill follow a similar model to Bet365 with a huge range markets for the Derby. Cups Betting recommends Bet365 for UK, Australian and New Zealand punters betting on the Derby. For punters in the USA BetOnline, who have a great reputation for fast cash-outs, usually have a market framed all year round for the English Derby. other options who usually have betting on this race include Bovada (North America).